On the rare occasion that images of American troops in the Great War are conjured up, most often a soldier wearing a soup dish style P17 helmet is what is pictures. The stereotype is not far off the mark. 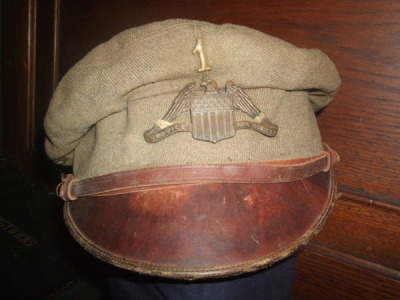 Thousands of American troops serving on the Western Front wore these helmets throughout the duration of the U.S. involvement in the First World War. Surprisingly though number of Americans wore the French Adrian helmet. This very fact leads to one of the most interesting and misunderstood helmet histories of the First World War. 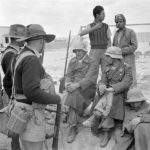 While the United States enjoyed it’s neutrality, a small number of Americans found ways to serve in the expanding European conflict. One of the most popular ways to contribute to the cause was to serve as an ambulance driver in the American Ambulance Field Service, AAFS. 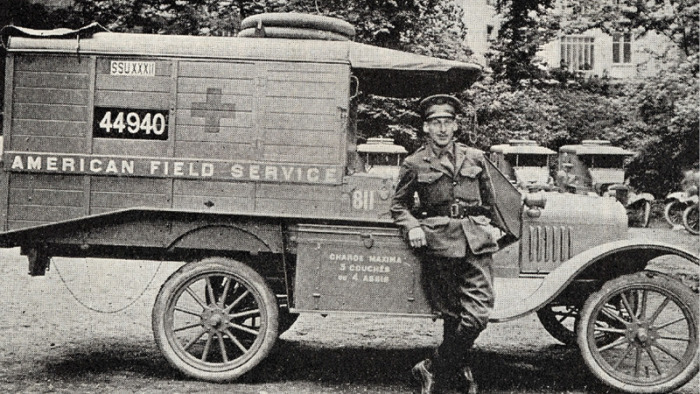 The American Ambulance Field Service, later known as the American Field Service, was initially made up of U.S. citizens from the American colony in Paris. Many had lived in France for years, spoke French, and had a deep love for their adopted country. The AAFS also recruited from a variety of American universities. The AAFS was tasked with driving wounded men from rail head depots back to military hospitals. The drivers were not to venture to the battlefront because French policy at the time forbad it. This was all to change. 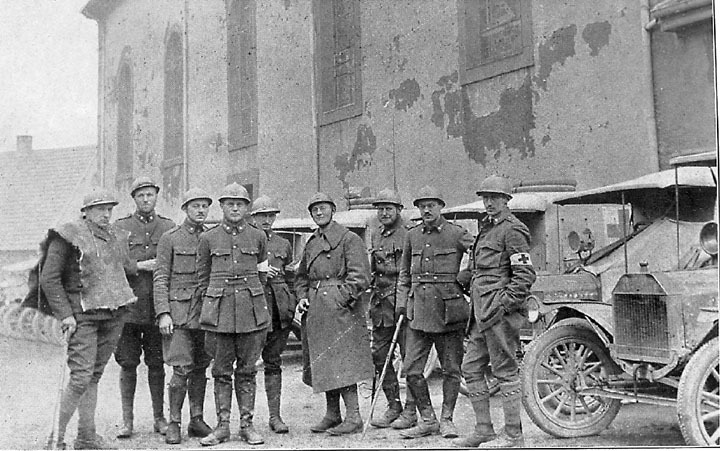 In March of 1915 the AAFS argued with Captain Aime Doumenc, head of the French Army Automobile Service, that the American ambulance drivers were bored with their work and wished to experience the dangers and excitement of picking up wounded at the front. Doumenc agreed and the policy was changed. 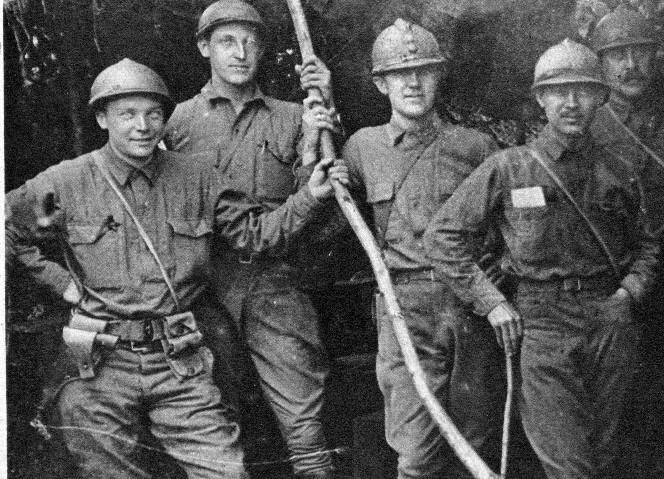 It was the decision of allowing these American divers to pick up wounded at the front that led to the need for a protective helmet. At the time of the policy change these American drivers wore a floppy wool crusher style cap which offered little protection. The French realized the imperative need for a protective steel helmet due to heavy casualties in 1914. 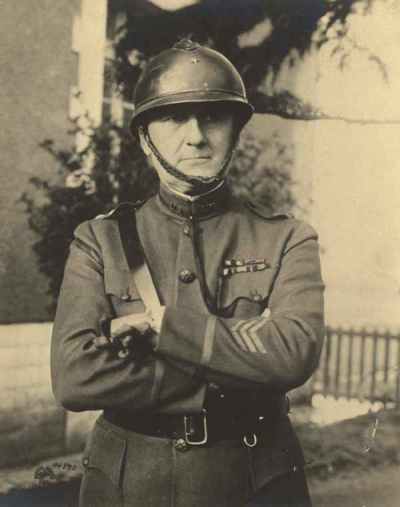 Seeing a need, General Louis Auguste Adrian developed a helmet, the Adrian helmet, to be used in combat; however, the helmet would not be completed and issued to French forces until September of 1915. Because the need to better equip the French forces was top priority, the AAFS drivers would have to brave the deadly shrapnel bursts without adequate head protection. 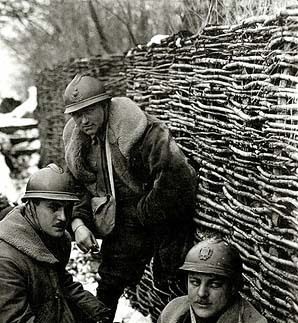 It is somewhat speculative as to when the AAFS began to procure French helmets. Members of the AAFS were required to pay for their own uniforms and equipment so they were not issued helmets. Drivers would have to purchase them on their own, but, in all likelihood, it was probably months before additional Adrian helmets were available for purchase by members of the AAFS. One of the notable features of the Adrian helmet is the removable frontal insignia. 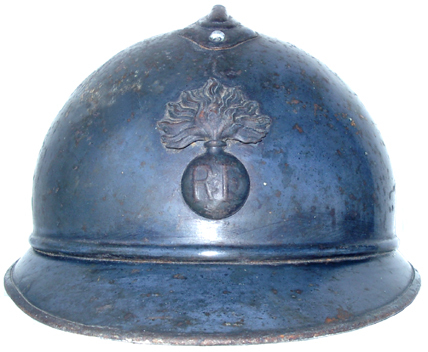 Each branch of the French military had it’s very own distinctive helmet insignia with the letters RF emblazoned on the front for République Française. Some drives removed the French insignia or perhaps purchased the helmet without it. Many others choose to wear this symbol of the French military. 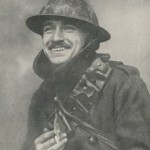 It should not be surprising that some men choose to proudly wear the French insignia as they volunteered to serve France; however, the wearing or not wearing of the French insignia was not the only option available. 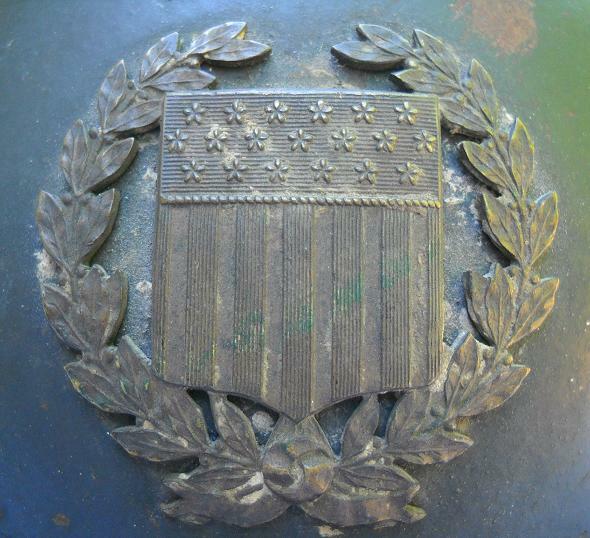 An American insignia, or frontal plate, was made for the drivers of the AAFS; however, little is known about the history of this American Adrian frontal plate. Original examples are found to be made from cast brass and some have been found with silver inlay. The American insignias are of a higher quality then the regular French Adrian insignias. 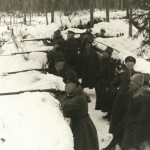 Only a few original photos exist showing it’s use during the war. It is probable that the insignia was made for private purchase by members of the AAFS in France. The AAFS also operated in Albania, Greece, Italy and Serbia, but the insignia rarely seems to appear on these fronts. Original Adrian helmets with American insignias where the original owner can be identified seem to back this theory up. 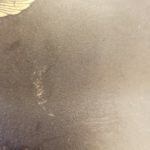 Researchers have been able to identify the original owners of Adrian helmets with American insignias because drivers wrote their names on the inside of the helmet. With the help of service records, these volunteers can be linked to service on the Western Front. 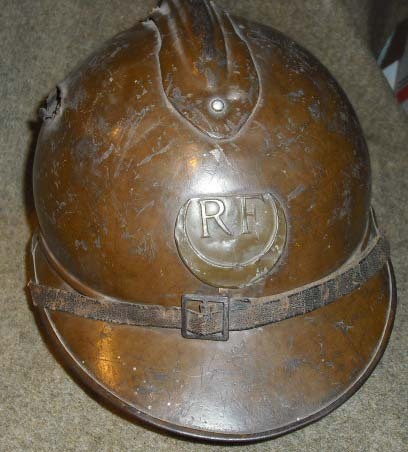 Although at least one helmet has been found that was linked to a driver who served on the Italian front. This specific insignia was only meant for members of the AAFS in the era before the U.S. became involved in the Great War. 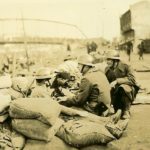 After the U.S. became involved in World War I and began shipping troops to France, it was quickly realized that a steel helmet would be needed for troops serving at the front. 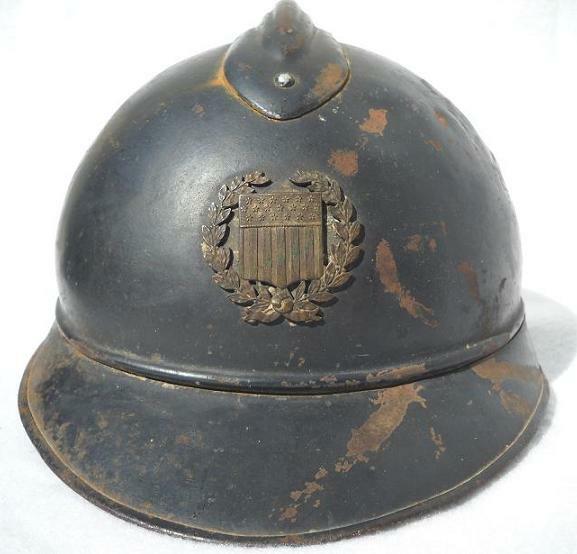 A decision to acquire the soup dish style British Mark I helmet was made and some 400,000 were purchased from the British for issue to American troops. However, not all American troops would receive this helmet. The U.S. 369th, 370th, 371st, and 372nd Infantry Regiments, regiment made up entirely of black Americans and some cases Puerto Ricans, were assigned to the French Army. 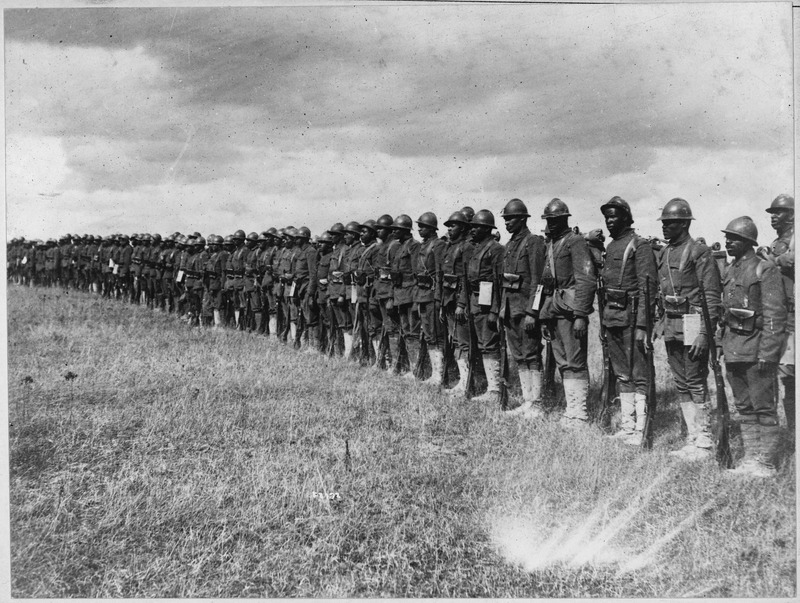 The most famous of these regiments was the 369th or more famously known as the Harlem Hellfighters. 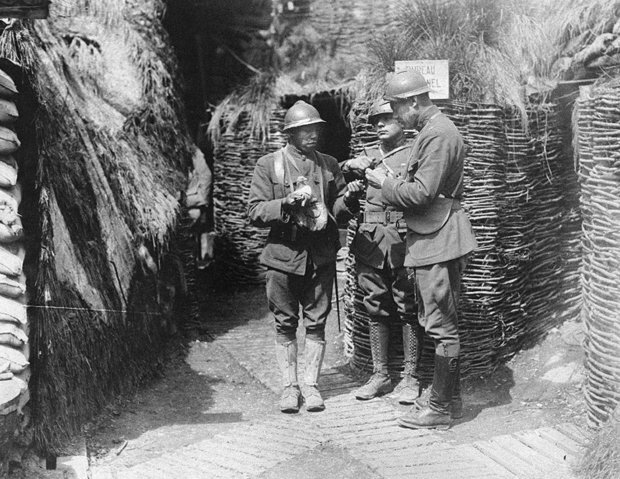 While these troops continued to wear American uniforms for the duration of their service in Europe, the French issued to them French field gear, weapons, and an Adrian helmet. Over the years some confusion has developed between the helmets issued to the American black troops assigned to the French army, and the existence of the AAFS Adrian helmet with the American frontal insignia. Some have assumed that because they were American that the French would have issued these troops helmets with a special American insignia. In truth these troops were issued a mix of horizon blue Adrian helmets with regular infantry insignia, or colonial mustard colored Adrian helmets with Zouave or Tirailleurs insignia. 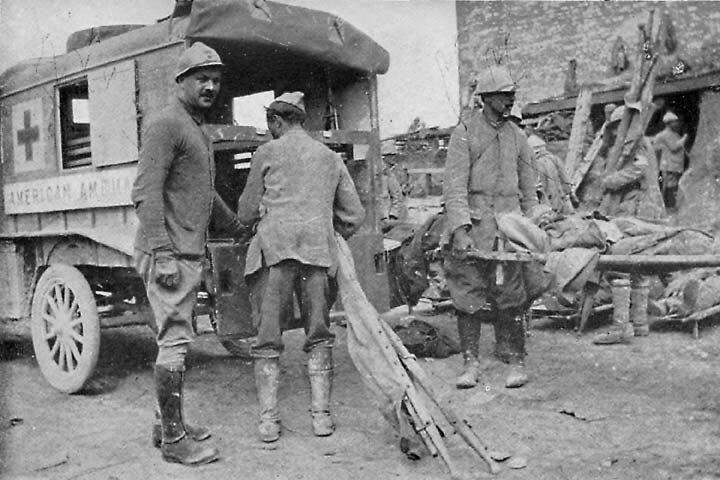 As these men were assigned to the French army, they would have been issued equipment from whatever French equipment depots were local to them. In some cases these men were assigned to serve alongside French Colonial regiments and therefore received the same helmet. 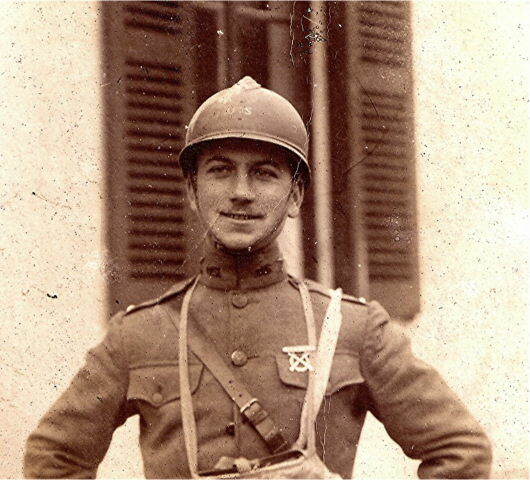 While it maybe possible that a few members of these regiments managed to acquire one of the American crests for their helmets, this must be considered the exception as photographic evidence only seems to support the wearing of French insignia or no insignia at all. Unfortunately this confusion has led to a number of paintings and other depictions of the 369th with the American insignia on their helmets which they never wore. A surprising number of original photographs exist of American officers wearing Adrian helmets. Most often these photos are incorrectly attributed to be officers of the 369th. 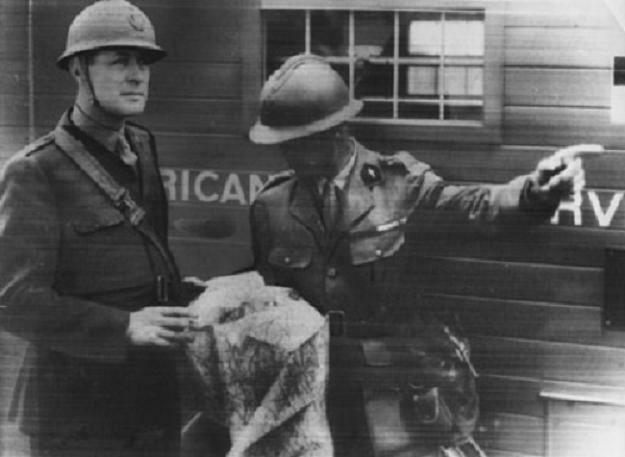 Some American officers chose to wear the French American helmet instead of the “official” British Mark I. Similar to officers in most militaries, American officers were required to purchase their own uniforms and equipment, so many chose to procure for themselves a French helmet. The reasons for this varied by individual. It may be that some found the helmet to be more comfortable then the British Mark I, or others may have simply liked the way the helmet looked on them. It could be that some saw this as a way to distinguish themselves from their men as an officer. It should be noted that Americans of the era had an affinity and respect for France and the culture. The distaste for the French which still infects aspects of American culture to this day did not manifest itself until much later. Educated Americans at the time studied and often spoke French. Many Americans believed they owed France a great debt due to the aid the French rendered during the American Revolution. It may be that due to this respect and admiration some American officers had for the French they wanted to wear the French helmet. Whatever the reasons were, many officers chose to wear a French helmet. This American officer wears his Adrian helmet with the French insignia removed, and replaced with a hand rendered U.S. The Adrian helmet may never be recognized as an American helmet of the Great War. Still the helmet saw plenty of service with the Americans. 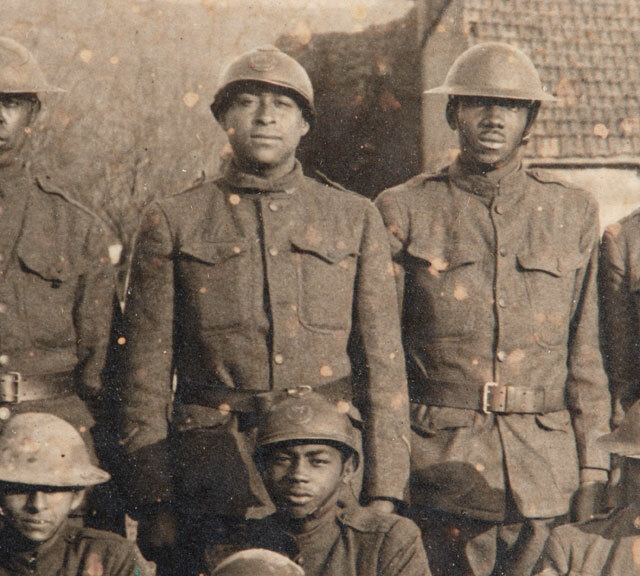 From American volunteer ambulance drivers, Harlem Hellfighters, to the officers, the Adrian helmets did it’s part of protecting these men who served in the Great War. 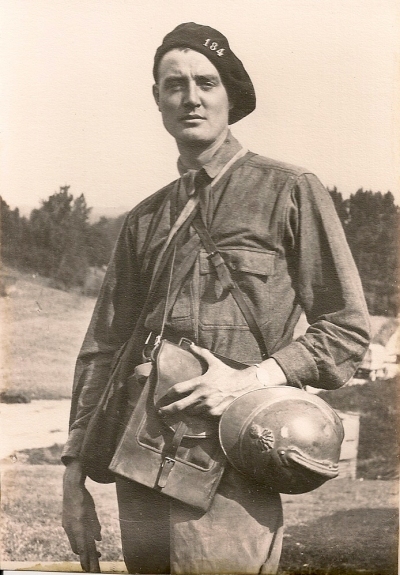 For this reason alone the Adrian helmet deserves to take it’s place among the many steel helmets worn by American troops from the Great War to the present day.